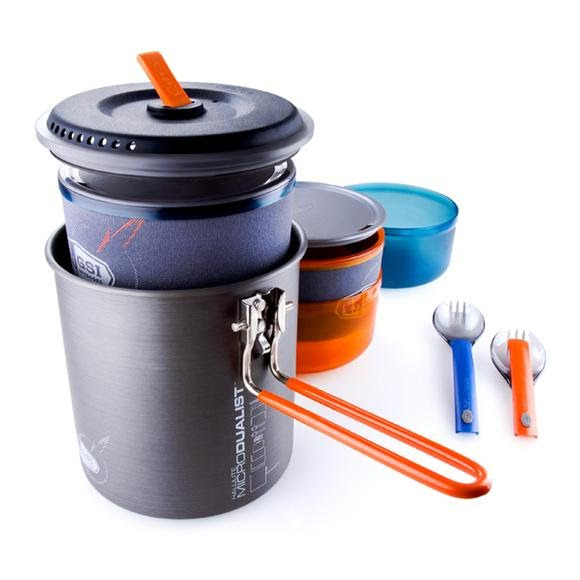 GSI Outdoors' incredibly light cookware solution for 2 person teams, the Halulite MicroDualist sets the bar for durability, versatility and smooth, even heating! GSI Outdoors&apos; incredibly light cookware solution for 2 person teams, the Halulite MicroDualist sets the bar for durability, versatility and smooth, even heating! Halulite says goodbye to scratches, burn circles and ounces. As light as Titanium, Halulite is a proprietary alloy that also conducts heat better and more evenlyÑso you can leave the extra fuel at home. Plus, every piece is Hard Anodized to create a surface that withstands scratches and abrasions like nothing else. It&apos;s ultra light without the sacrifices. Now that&apos;s smart. Infinity is an ultra-lightweight, completely recyclable, BPA-Free alternative to Polycarbonate resins. With exceptional clarity, jewel-like brilliance and 25% weight savings over Polycarbonate; its beauty is truly inspired. Furthermore, Infinity will not absorb food odors like other plastics and will not leach plasticizers or other chemicals into either food or beverage. Infinity pieces remain strong in both hot and cold and are so light that they actually remain buoyant when filled with water. ItÕs even dishwasher safe and actually becomes more stain-resistant with every wash.
Dimensions (packed) 5.60" x 5.50" x 5.90"